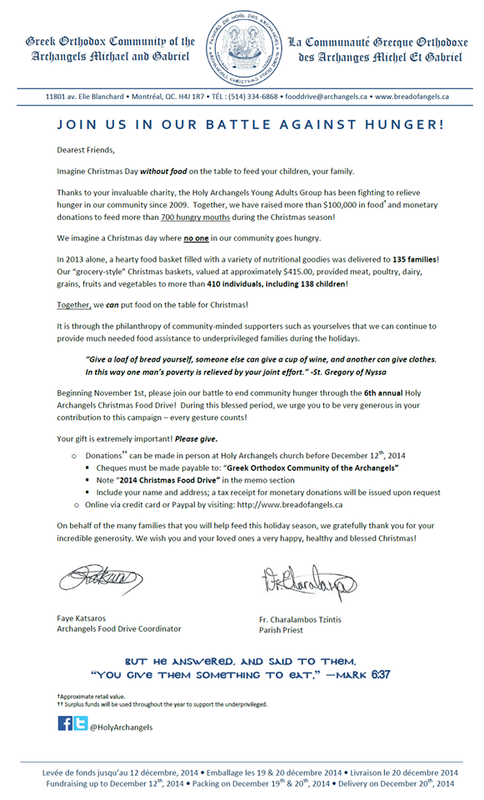 Archangels Michael and Gabriel Church officially launches its 6th Annual «Bread of Angels» Christmas Food Drive on this Sunday, December 7, 2014 with a reception after the divine liturgy in the church hall. Founded in 2009 by the parish priest Rev. Fr. Charalambos Tzintis and a group of dedicated volunteers, this year’s food drive committee has once again set a goal of distributing 135 food baskets to needy families and children across the Island of Montreal and beyond. The Greek Orthodox Community of the Archangels Michael and Gabriel was incorporated in 1968 and is the second oldest Greek Orthodox religious corporation in Quebec founded in communion with the Ecumenical Patriarchate of Constantinople. Ecumenical Patriarch Bartholomew is the spiritual leader of all Eastern Orthodox Christians and serves the Most Venerable Patriarchal Church of Saint-George in Istanbul – formerly Constantinople and former capital of the Byzantine Empire, sometimes known as the Eastern Roman Empire.